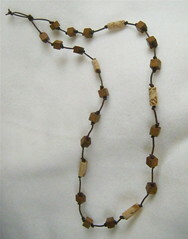 This is a necklace that I finished yesterday. I had the original idea a few days ago, but I had to re-do the necklace because I didn't measure before I started. I had to untie a whole bunch of knots, which wasn't fun. Then I started over, and the second time around, I used a design board. In the end, I was happy with the result, so it was worth it. I used Painter to create this digital woodcut from my photograph of a magnolia tree after a big snow storm (posted two days ago). 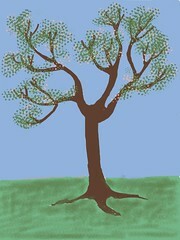 This version of the image emphasizes the lines of the branches and the shape of the buds. 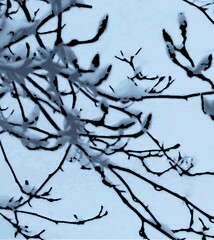 Yesterday I posted my photograph of magnolia tree branches in the snow. I used Painter to create the posterized version that I am publishing here tonight. I kept the effect subtle, but you can see some purple and blue tones in the snow. I also used Painter to create a digital woodcut of the same image, and I plan to post it here tomorrow. Yesterday I took some photographs of the magnolia tree in the deep, deep snow. Today I cropped this image out of the original photograph. Then I used the retouch tool in iPhoto to get rid of some extraneous stems and leaves. Then I opened the image in Painter and used some digital pastel to clean up the remaining marks, leaving only the branches of the magnolia tree. The buds are visible against the snow, a reminder that spring is inevitable. A snowy day was a good excuse to work on this project for a while. 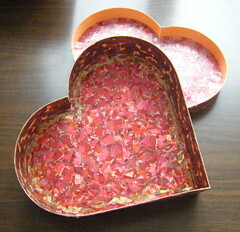 I am covering this heart-shaped box with decoupage and collage created from printed metallic ribbons. Today I continued to work on the interior wall of the box. I am slowly making progress, although there are still lots of gaps and I am beginning to worry (again) about running out of pieces of ribbon in the main pattern that I am using. If that happens, I will have to pull pink, blue, and green pieces from some of the other patterns. This is cropped from a photo that I took about ten days ago. (Here north of Boston, we have had so many snowstorms lately that they are all beginning to run together in my head, but this was definitely mid-January.) This was taken around seven AM. I wanted to capture the snow-covered trees against the colors of the sky, so I grabbed my camera and took a picture through a screened window. I didn't set out to capture the screen particularly, but I wasn't worried about it either, because I know that sometimes it works to add texture to the image. In this case, as it turns out, I did like the effect. Tonight I opened the original picture in iPhoto and straightened the image (especially important with this picture so the mesh of the screen wouldn't be too far out of sync with the rest of the image). Then I cropped the image once, and then cropped it again to get this composition. Tonight I used Painter to edit and posterize a photo that I took back on January 12, after one of our apparently unending snowstorms. Before I posterized the original photo, I cropped it and then sharpened the focus, and increased the contrast. After I transferred the image back to iPhoto, I cropped it one more time to get this composition. Snow can be a huge inconvenience, and can make it difficult to do the simplest things. But it helps me to remember that snow can also be very, very beautiful. 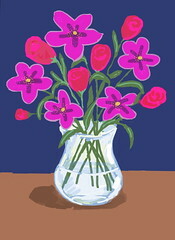 Yesterday I posted a digital sketch, a little still life that I drew on my iPad with the Brushes app. As you draw, Brushes captures your "actions" and produces a little animation of the drawing. Apparently if you make a correction too late in the process, it throws Brushes off. So to correct the problem, I opened the video in iMovie so I could add the still image at the end, and I think that resolved the issue for this little video. I love the Brushes app! Here north of Boston, we are in the deep freeze, but I saw some beautiful flowers in the supermarket this morning, during a trip to Whole Foods. Later, I decided to get some practice in with Brushes on my iPad, and I found myself drawing flowers. I was working from my imagination, but I was thinking about the lilies and roses I had seen earlier in the day. And spending an hour imagining flowers this afternoon was a nice little January vacation today. Tomorrow I plan to post the stroke-by-stroke video. This image began with a photo that I took on Thursday morning, around 7:30. 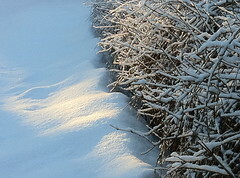 I liked the way the morning light was hitting the snow-covered branches in the distance, so I took some photos. The effect I was most interested in was part of the background of the original photo. So I did some preliminary cropping in iPhoto, and then opened the image in Painter. I adjusted the focus, brightness, and contrast, and then posterized the photo, trying out different levels till I had what I wanted. Then I used some color overlay on the sky (soft yellow). Finally I cropped twice more to get this composition. 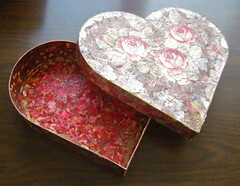 Today I finally got back to this project, a heart-shaped box that I am covering with collage and decoupage created from printed metallic ribbons. I am still working on the inside wall of the box, which I am covering with ribbon printed in pinks, blues, and greens. (In this photo, the inside of the box top is also visible.) This is slow going, but I can see progress. Besides, I like the process; it's kind of like a meditation. Just as in life, if I can get quiet, if I can stop and think, it is easier to see how all the pieces can fit together. This morning I got up early to let the dog out. The morning light on the snow was beautiful, so I grabbed my iPhone camera and went outside again to take a few pictures. These are the colors I saw this morning. 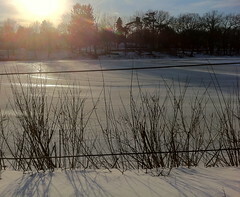 The original photo has not been altered, apart from cropping to emphasize the contrasting textures and to focus on the patch of sunlight on the snow. This is a stroke-by-stroke video captured by the Brushes app as I drew on the iPad. As is plain to see, I still have a lot to learn about making these little animations, but it is fun to learn something new. I did a series of five sketches, showing the same tree going through a year's worth of seasons. The drawings are not polished, and I had some issues with the videos. (Apparently if you make changes too late in the process, Brushes has problems capturing the change.) But I used iMovie to add some stills to try to solve the problem. I got the idea for this project a few weeks ago when I saw on my calendar that Tu B'Shevat was coming up. This holiday is also known as Jewish Arbor Day or the New Year of the Trees, a holiday that I really don't do much about as an adult, but when I was a child, the idea of celebrating a New Year for the Trees captivated my imagination. But you don't have to be Jewish! I also think this little project also works is a good reminder that the seasons change, and even if you are slogging through a hard winter, spring is inevitable. This is a digital sketch that I drew on my iPad using the Brushes app. 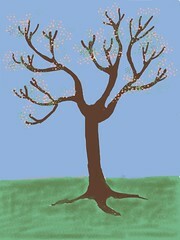 It is the last in a series of five little drawings of the same tree through the seasons. The starting point for these sketches was my idea for a little animation of the tree throughout the year. I got the idea because Brushes captures a stroke-by-stroke video as you draw. Tomorrow I plan to post my little video, in honor of Tu B'Shevat ("New Year for Trees"). This is a digital sketch that I drew on my iPad with the Brushes app. This is the fourth in a series of five digital drawings that I made of the same tree in different seasons of the year. This one is the tree in autumn. I will post the last of the sketches tomorrow. It was fun to sketch the trees from my imagination. But the goal that I started with was to create a little video from the sketches, with the help of my Brushes app. To be continued. . . . This is the third in a series of digital sketches created on the iPad with Brushes. 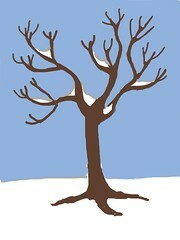 I drew a tree as it might look in every season of the year. These sketches are simple, but I started with the idea of creating a little animated video, because the Brushes app captures a sketch-by-sketch video as you draw. So that's where this is headed. To be continued. . . . This is a digital sketch that I drew on my iPad with the Brushes app. This is the second in a series, showing a tree through the seasons. Brushes captures a stroke-by-stroke video, which was the end result I had in mind when I thought of this project. To be continued. . . . This is a digital sketch that i drew on the iPad with the Brushes app. It is the first in a series of this tree in all seasons. I started this little project with the idea of creating a stroke-by-stroke video showing the changing seasons. To be continued. . . . Yesterday I used my digital camera to take this photograph. It was almost 3 PM and still snowing. (You can see snowflakes on the window in the photograph.) 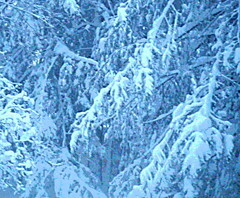 I love the way new-fallen snow emphasizes the lines of the branches. Tonight I cropped the original photograph to get this composition. 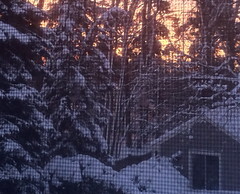 Here, north of Boston, we had lots and lots of snow overnight. This is one of the photos I took early this morning, thinking that I should get some pictures before the wind blew the snow off the branches. 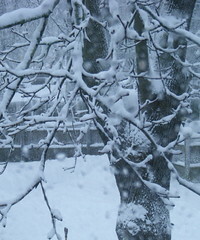 I needn't have worried, because it kept snowing hard throughout the day. For this picture, I used my digital camera, and took the photo through the window. I was interested in the tracery of the branches, the pattern of snow flakes on the glass, and the contrast with the snow on the roof and on the ground. Tonight I used iPhoto to adjust the exposure and contrast, and then cropped the original photo to get this composition. 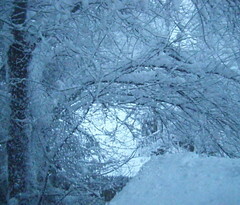 This is from a photograph that I took on the morning of January 2, 2011, a little after 8 am. 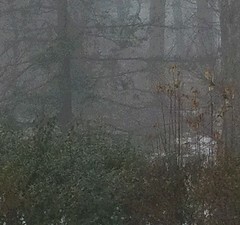 There was snow on the ground, but the air had warmed up enough to produce fog overnight. I love fog because I like the way it makes things look, and more than that, I like the way it forces me to look harder because colors and shapes are so subtle! Tonight I used Painter to crop the original photograph and posterize it. Today I used Painter to create this posterized version of the image I posted yesterday, the winter sun on the Cummings Center Pond (aka Shoe Pond) here in Beverly, MA. 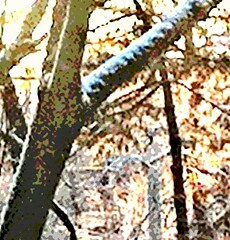 I also used a little color overlay to add a slight bit of yellow to the white area created by the sunlight. The original photo was taken on December 28. 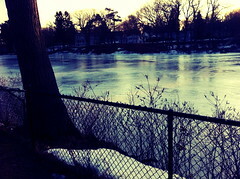 As a matter of fact, I went for a walk today at the pond, and the scene looked much the same. But the wind was blowing and it was far too cold to stop, take off my gloves (necessary with an iPhone camera), and take a picture. 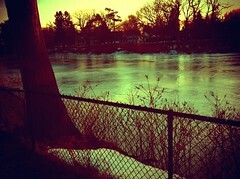 This is one of a series of photographs that I took on December 28th during an afternoon walk at the Cummings Center Pond (aka Shoe Pond) here in Beverly, MA. 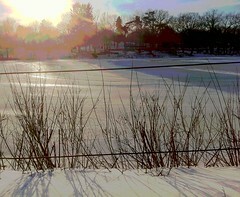 I liked the way the sun looked shining on the pond and the snow, so I took a picture with my iPhone camera. Tonight I cropped the original photo to get this composition. This image began with a photo that I took of a bouquet on my daughter's table, back on December 28. 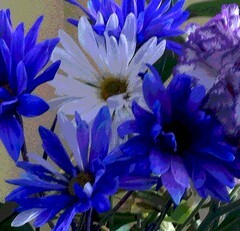 I loved the color of the flowers in the winter light, so I took a quick picture. I have been meaning to do something with the photo, but didn't get around to it. Tonight I cropped this composition out of the original photo, and then used Painter to posterize it. I thought it would be a good idea to post this today. When winter seems just a little too long, and the news of the day is too harsh, it might seem silly to think that taking a break to look at flowers can help. . . .but I think it does. I had to take my car in for repairs on Wednesday. It was late afternoon by the time I got the call that it was ready. The dealership is over in Danvers, a far shlep, but I have a Saturn so I don't have a lot of choices left for major repairs. On the ride back to the dealership to pick up my car, I was in the passenger's seat. It was almost 4:30 PM, and traffic was nearly at a standstill on 128. To kill time, I decided to get out my iPhone camera because the sky was amazing and because I thought it would be a good opportunity to try out another new iPhone app (well, new to me). This one is called Hipstamatic, and like the Camerabag app, it emulates other cameras, including vintage and toy. But it works differently than Camerabag because you choose emulations of film, flash, and lens before you shoot, rather than applying effects afterward as in Camerabag. Being stuck in traffic gave me time try out some of the lens and film choices, so I took lots of photos between Route 128 and Route 114. This one was probably the best of the lot. I used the "John S" lens, no flash, and the film was Kodot Xgrizzled. This image began as a photo that I took with my iPhone at the Cummings Center, here in Beverly, MA. I posted the original version on 1/4/11. Yesterday I posted my first try at using the "Camera Bag" app to add a film or camera emulation. Here is one more experiment with the "Camera Bag". This time I chose "Plastic", which is an emulation of a plastic camera. Yesterday I used my iPhone camera to take some pictures at the Cummings Center Pond, here in Beverly, MA. I posted the original version of this photo last night. 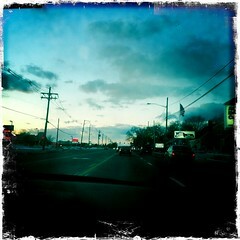 But I also experimented with an iPhone app called "Camera Bag". With this app, you can apply camera and film emulations to photos after you have taken them. I decided to experiment, and tried out a couple of choices with the image that I posted yesterday. This one was done with the "color cross" effect. The description the app supplies for this choice is "Hazy, chemical color-swapping straight from the darkroom." Well, I don't really know what I am doing yet, but I just played around with the choices until I found an effect that I like. But I am excited about the possibilities! 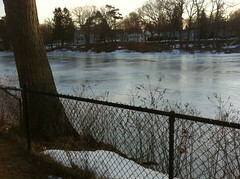 This afternoon, I was at Beverly's Cummings Center again for another walk at the pond. There is still a lot of snow on the ground, but the great heaps of snow have melted enough to make it easier to walk around today. So I took a lot of pictures with my iPhone camera. When I got home, I decided to try out my brand new "Camera Bag" app that creates camera and filter emulations for photos after they have been taken. (I also have a new app that allows you modify the iPhone camera before you take the picture; more on that soon.) Anyway, tonight I chose this photo to work with, and the image you see here is the original version. I also created two more versions with Camera Bag, which I plan to post tomorrow and the day after. 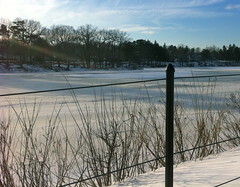 This is a photograph that I took on December 31 around 3 PM, during a walk at the Cummings Center Pond (aka Shoe Pond) here in Beverly, MA. The snow was beautiful, so I took some pictures with my iPhone camera. Tonight I used iPhoto to crop this image out of the original photograph. I also adjusted the brightness, contrast, and saturation. 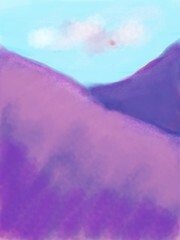 Yesterday I posted a digital sketch call "Distant Mountains" that I drew on the iPad, working from my imagination but inspired by memories of the Colorado mountains. Today I am posting this stroke-by-stroke video captured by the Brushes app as I drew. I began by working with transparent layers of color because I often create watermedia paintings of mountains with a similar format. This is a digital sketch that I created on the iPad this week using the Brushes app. I was working from imagination, inspired by memories of the mountains of Colorado, my home state. This imagery and format are pretty close to my watermedia paintings of mountains, so I decided to see if I could use transparent layers of color to build up an image. I was only partly successful in that goal, but this image is the end result, and I am happy with it. Tomorrow I plan to post a stroke-by-stroke video (captured by the brushes app), which makes it possible to see the process.